Paradox BowSling Elite Custom Cobra - Neon Green. These handcrafted slings are modern, rugged and good-looking and feature American harness leather mounts and unique paracord color combinations. Comes with a stainless steel cone washer. 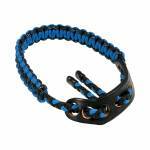 ..
Pine Ridge Archery Kwik Sling. 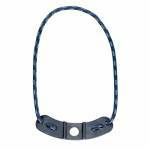 Keep your hand steady on the bow with this braided easy-adjusting bow sling. Grip is easily accessible without fumbling. Holds it's shape and can be adjusted to fit any archer. .. Protect your cams, cables and strings so your bow stays in top shape. The Neoprene Bow Sling is a must when the terrain gets rough. Your hands are free to climb hills or scan the terrain with your binoculars. Once you’ve tried it, you won’t be without it. 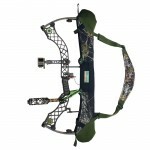 Fits all bows 28″ to 38″ ATA Fits all parallel limb bows Protects your cams, cables and strings Wide shoulder strap to reduce slipping Available in Realtree AP Xtra ..